Product Description: Daily protective formula promotes vibrant sheen and long-lasting color. Griffin Remedy Color Extend Shampoo Formula, uses plant-based cleansers to gently wash away dirt and oils as it protects color from fading, leaving hair moisturized, shiny and vibrant. Cranberry Seed Oil moisturizes while helping to hold color. Green tea softens as it fortifies hair. Ingredients: Purified Water, Decyl Glucoside, Coco Betaine, Soy Protein, Coconut Glycerin, Orange Essential Oil, Citric Acid, Cellulose Gum, Sodium Benzoate, Vitamin B Complex, Organic Aloe Vera Juice, Jojoba Seed Oil, Green Tea Extract, Cranberry Seed Oil. Suggested Use: Apply to wet hair, lather the rinse. Repeat. 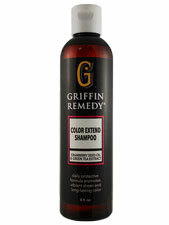 Best to follow with Griffin Remedy Color Extend Conditioner.